Your integrations page controls high level items about your Amazon integration, like your account credentials, feed options, and other account-wide settings. Here's a breakdown of what you'll see when you click on Amazon. - It's generally recommended to set this to production mode as soon as possible. Once you do, Zentail will automatically start getting SKU values and inventory updates from FBA. Note that we won't send the information anywhere unless other settings are enabled. - Zentail has a separate set of keys for price updates on Amazon that allows us to reprice 5 times faster than through the same set of keys. - If you plan to use the repricer, you can get that set of keys here. - If you always want your products to list with a default condition description, like "brand spanking new", you can put that here. - You can still control this on a per SKU basis whether or not this is filled in. - Allows you to adjust your customer support contact information as well as the seller profile name in Amazon Seller Central. These fields will also be used for configuring purchasing Seller Fulfilled Prime labels through Zentail (coming soon). - Ex: The Price Feed basically say "is Zentail allowed to send price to Amazon?" Just because you enable doesn't mean Zentail starts sending price information, you'll still need to set a SKU to list. - With this enabled Zentail will only send one parent SKU for your groups even if your SKUs are merged. With this disabled two parent SKUs will create in Amazon Seller Central, one for the FBA SKU and one for the Merchant Fulfilled SKU. 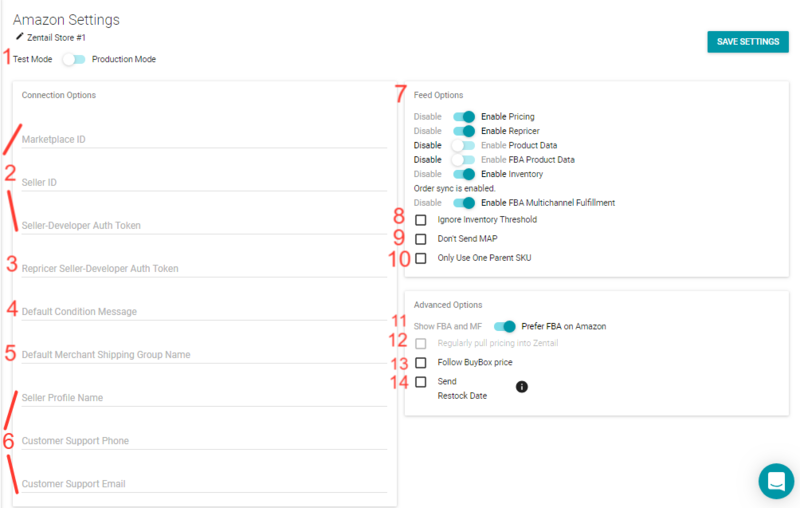 - Allows you to run out of FBA inventory before showing MF inventory on Amazon. - This sets your item price in Zentail to your current Amazon price. This should really only be enabled if you are using an outside repricer that you would like to determine your price on other channels. - Allows you to make your products available on Amazon while you are currently out of stock by showing a restock date.